Jerash (ancient Gerasa) is located 50km (30mi) north of present-day Amman (ancient Philadelphia) in Jordan. The locale had been occupied from Paleolithic times onward, but achieved its greatest prosperity under the Antonine emperors of Rome in the second century AD. Prior to this, in the second century BC, a small town had emerged there, incorporated into the Mediterranean world as a minor Seleucid colony. By the first century BC, Hellenistic Gerasa had become entangled in the collapse of the Seleucid dynasty, and had briefly passed under the control of the Hasmonean kings of Judea. In 64 BC, Pompey the Great marched into Syria and attached Gerasa to his newly-formed province. The pax Romana stimulated economic development and trade throughout the region. 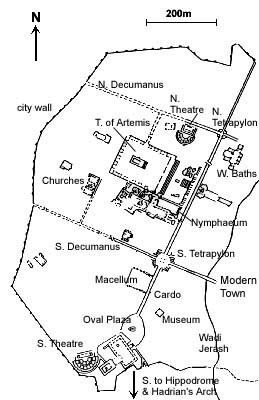 By the first century AD, Gerasa had become thoroughly urbanized, joining the regional association of leading cities called the Decapolis (the "Top Ten," as we might say today) which included Damascus and Philadelphia (present-day Amman). Gerasa got another boost in 106 AD, when Trajan annexed it to the Province of Arabia and connected the city to his new road (the Via Nova Traiana) that led from Bosra to the Red Sea. The city benefited greatly from a visit by Hadrian, in 129 AD, that led to additional honors, ramped-up construction, and a general increase in prosperity. During the rest of the second century AD, the now-populous city of 20,000 - 25,000 people enjoyed a Golden Age of civic splendor, constructing new temples to Zeus and Artemis, a Hippodrome, and an Odeon. As the city rose with the fortunes of the Antonines, so it lapsed with the decline of Roman power in the third century AD. In the fourth century, Rome's Eastern provinces again revived when the capital was relocated to Constantinople. Byzantine Gerasa shared in the economic revival, inaugurating a new era of church-building and mosaic art, until felled by three world-changing blows: the Muslim conquest of 636, the removal of the capital from nearby Damascus to far-away Baghdad in 750, and a disasterous series of earthquakes that followed shortly thereafter, as if to physically erase a thousand years of Hellenism in the Middle East. It must have seemed, to the few cowed and fleeing survivors who carried the dream of Rome out of their destroyed and ruined city, that God and history had abandoned them forever. The site of ancient Gerasa lay deserted for the next thousand years, until resettled by the Turks in the late nineteenth century. The modern town follows the Turkish settlement, overlaying the eastern part of the ancient city; the archaeological site encompasses the area west of the wadi, that visitors see today.